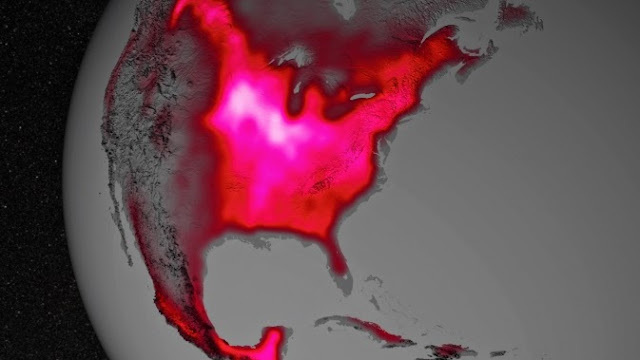 Data from satellite sensors show that during the Northern Hemisphere's growing season, the Midwest region of the United States boasts more photosynthetic activity than any other spot on Earth, according to NASA and university scientists. Healthy plants convert light to energy via photosynthesis, but chlorophyll also emits a fraction of absorbed light as fluorescent glow that is invisible to the naked eye. The magnitude of the glow is an excellent indicator of the amount of photosynthesis, or gross productivity, of plants in a given region. In the image below, the color red was applied to the illustration to represent the glow. Research in 2013 led by Joanna Joiner, of NASA's Goddard Space Flight Center in Greenbelt, Md., demonstrated that fluorescence from plants could be teased out of data from existing satellites, which were designed and built for other purposes. The new research led by Luis Guanter of the Freie Universität Berlin, used the data for the first time to estimate photosynthesis from agriculture. According to co-author Christian Frankenberg of NASA's Jet Propulsion Laboratory in Pasadena, Calif., "The paper shows that fluorescence is a much better proxy for agricultural productivity than anything we've had before. This can go a long way regarding monitoring – and maybe even predicting – regional crop yields." Unlike most vegetation, food crops are managed to maximize productivity. They usually have access to abundant nutrients and are irrigated. The Corn Belt, for example, receives water from the Mississippi River. Accounting for irrigation is currently a challenge for models, which is one reason why they underestimate agricultural productivity.